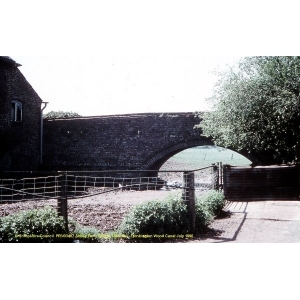 Brief Description: Scheduled Monument [where it passes through Lilleshall Abbey]: The remains of a late 18th century canal, built in 1774, making it only the second of the canals of the Industrial Age to be constructed in England. (00) Card index: Shropshire County Council SMR. Site and Monuments Record (SMR) cards. SMR record cards. SMR Card for PRN SA 03407. (01) Monograph: Hadfield C. 1969/1985. Canals of the West Midlands. p41, p150, p238. (02) Monograph: Philips. 1809. Inland Navigation. p285. (03) Photograph: Tyler Alan W. 1978/ 1979. Slides. Colour. 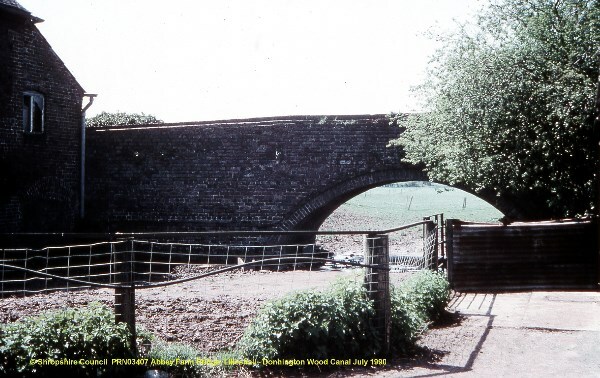 (04) Photograph: Tyler Alan W. Donnington Wood Canal, Old Furness Lodge. Colour. (05) Photograph: Tyler Alan W. 1990. Donnington Wood Canal. Colour. (07) Planning archive: Haigh David H. 1993-Sep-15. Comments on Landscaping Application, addressed to Wrekin DC, 15/09/1993. (08) Field survey report: Horton Mark C. 1987. Granville Country Park: an evolving industrial landscape. Ironbridge Inst Res Pap. 23. pp.91; 94-96. (09) Archaeological fieldwork report: Elsworth J & White K. 1988. Granville Country Park: further archaeological investigations. Ironbridge Inst Res Pap. 32. pp. 27; 39-40. (10) Scheduled Monument notification: English Heritage. 1997. Scheduling Papers (Revised Scheduling, 21/02/1997). 29364. (11) Oblique aerial photograph: Shropshire Council. 2009-Apr-5. SA0908_158 (1 photo) Flight: 09_SA_08. Colour. Digital. (12) Oblique aerial photograph: Shropshire Council. 2009-Apr-5. SA0908_165 (1 photo) Flight: 09_SA_08. Colour. Digital. (13) Volume: Shropshire Caving and Mining Club. 1970. Survey of the Church Aston-Lilleshall mining area, near Newport, Shropshire. Shropshire Caving and Mining Club Accounts. No 7. (14) Volume: Adams D R. 2015. The History of Limestone Mining in Church Aston & Lilleshall near Newport, Shropshire. Shropshire Caving and Mining Club Accounts. 25.